Q: Am I able to breathe through my nose after my rhinoplasty surgery? A: Typically patients are able to breathe through their nose, somewhat restricted, if only a rhinoplasty surgery is being performed. There is no packing placed on the inside of the nose. If a deviated septum surgery (septoplasty) has been performed and/or inferior turbinate surgery has been performed, patients are usually unable to breathe at all out of their nose for one week in the postoperative period. The breathing improves during the second week and is significantly improved by the third week, if a septoplasty is performed. Q: Is rhinoplasty an outpatient surgery? A: Yes, patients are discharged to home from the Seattle Rhinoplasty Center. Out-of-town patients stay in one of the local area hotels. There are four hotels conveniently located within a block of the office. Patients do not need to stay overnight in the hospital unless there are some other medically-related conditions. Q: Do you perform computer imaging for my new nose? A: Yes we do perform state-of-the-art computer imaging for rhinoplasty, which is done at the time of the consultation in the privacy of the office. Q: How is the bump taken off my nose? A: The bump on the nose is composed of both cartilage and bone. Depending upon how large the bump is, it may have to be surgically shaved down. On some occasions, the nose bones have to be narrowed to adjust the new nasal bone contour once the bump has been removed. Q: How is the tip surgery done? A: There are many techniques involving tip surgery during the rhinoplasty procedure. There are different cartilage grafts that are used to strengthen, bolster, and widen a pinched tip. There are different tip techniques that are performed to remove the thick bulbous wide projecting tip and also balance the tip to be more in line with the facial proportions. Sometimes these techniques involve suturing the tip cartilages together. Q: Is there financing available for my rhinoplasty? A: Yes, the office takes VISA and MasterCard and third party financing options are available through Care Credit. Q: How is a broken nose fixed? A: It takes a lot of force to break the nose and twist it. To reset and realign the nasal bones, both medial and lateral osteotomies and resetting of the nose bones back to midline have to occur to allow the natural bones to heal in a more straight condition. Occasionally, cartilaginous spreader grafts are used if the cartilaginous component has been fractured off the bony component of the nose. This can also help with breathing. Q: How do I know if my medical insurance will cover my nasal surgery? A: The office and the Rhinoplasty Center will preauthorize any upcoming nasal surgery such as septoplasty, turbinate surgery or sinus-related surgery with your medical insurance plan. Dr. Portuese and the Seattle Rhinoplasty Center are credentialed with all major insurance plans in the Pacific Northwest. Cosmetic nasal surgery is not medically necessary and is paid for by the patient. Q: Do you ever perform chin implant surgery with a rhinoplasty? A: Many times patients who have prominent noses also have a weak chin profile. Very frequently Dr. Portuese inserts a chin implant to give better facial balance, while at the same time de-projecting the nose. Please see our before and after photo gallery of chin implants for examples of this. Q: Can rhinoplasty be performed with other facial surgeries such as a facelift and eyelid surgery? A: Yes, in many instances rhinoplasty is done in conjunction with a blepharoplasty or a facelift. Q: What is done when the nose is too narrow? A: During a rhinoplasty for a very narrow nose, osteotomies can be done to widen the nasal bones and cartilaginous spreader grafts can be placed to widen the middle third of the nose as well. Q: I have a very prominent nose. Can this be brought back in closer to my face? A: Yes. Many times a rhinoplasty de-projects a very prominent nose so that it has better facial aesthetics and balance with the facial features. Q: The tip of my nose is very bulbous and wide. Is there anything that can be done about that? A: Yes. There are many different tip techniques that are used to sculpt the tip cartilages of the nose to improve and refine the shape of the nasal tip. Most techniques involve refining the tip to make it smaller. Q: Can you narrow wide nostrils? A: Yes. The nostrils can be narrowed if they are quite wide by taking small triangular portions out of the base of the nostrils, with the incision hidden on the inside of the nose. A: Our office policy is to avoid aspirin, ibuprofen, vitamin E, and all herbal products for two weeks prior to the surgery. This is to prevent any nose bleeds from occurring in the postoperative healing phase. Women of childbearing age need to make sure they are not pregnant before undergoing elective cosmetic surgery. Q: Is the pain severe after a rhinoplasty? A: No. There is mild-to-moderate discomfort after a rhinoplasty and/or nasal surgery. Since there is no packing placed on the inside of the nose, this is typically not a painful operation. Patients usually take mild pain medication for the first day or two after the surgery and then switch to Tylenol for minor discomfort after the first few days. Q: Is revision rhinoplasty different than primary rhinoplasty? A: Secondary and revision rhinoplasties are always much more difficult than a first time primary rhinoplasty. There is more unpredictability of healing with prior scar formation from previous surgery. Q: Who performs my anesthesia? Q: Where is the rhinoplasty performed? 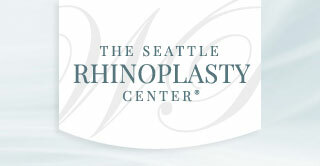 A: The rhinoplasty surgery is performed at the Seattle Rhinoplasty Center located on First Hill in Seattle, Washington adjacent to Swedish Medical Center. Q: If I am traveling from out of town to have my rhinoplasty, how long do I need to spend in town before I can go home? A: Typically, Dr. Portuese likes patients to be in town for at least one week after their nose surgery to take the cast off and check healing progress. In an ideal situation, he also likes to see patients back approximately one month after the surgery to see how the final result is coming along and again three months, six months, and one year postoperatively. Q: How long does the cast stay on the nose after surgery? A: Typically, the cast will remain on the outside portion of the nose for five to seven days. The cast is removed by Dr. Portuese usually at your first postoperative appointment. Q: Are there any incisions on the outside of the nose? Q: What if I have questions about my nose after the surgery? A: At the Seattle Rhinoplasty Center, our caring staff of three registered nurses, patient coordinator, and ancillary staff are able to answer questions. If they are unable to answer the patient’s questions, Dr. Portuese will personally answer all questions necessary to make sure that patients feel comfortable with their new nose. Q: How long do I need to take off work after my nasal surgery? A: Most patients take approximately one week off from their work environment. The cast will usually stay on the nose for approximately one week after the surgery and bruising and swelling lasts upwards of two weeks. Patients who are able to work from home can certainly do computer, phone work and book work but may not feel comfortable venturing out of the house until the cast is removed from the nose. Q: Do I need to take a pregnancy test prior to my nasal surgery? A: It is a very good idea to have a pregnancy test done within a few days prior to any surgery including rhinoplasty surgery. The anesthesiologists who perform anesthesia in our surgery center do not wish to have women who are pregnant put to sleep under anesthesia for cosmetic nasal surgery. Q: Is there any other blood work I will need to have prior to my nasal surgery? A: Depending upon your medical conditions; if you are taking a diuretic, a potassium level will need to be performed within the week before the surgery. Men 45 and over and women 55 and over will need a recent EKG within six months of the date of the surgery to make sure that there are no heart issues. Patients who have high blood pressure need to be taking their current medications to make sure that their blood pressure is under control going into the surgery. This helps prevent nose bleeds in the postoperative period. A: There are three sources of nausea and vomiting after nasal surgery. The first is from the actual anesthetic itself, which can last the first 12 hours postoperatively. After that, the nausea and vomiting can be related to taking pain medicine or swallowing blood down the back of the throat. We ask patients, if they are not actively bleeding, to taper off the pain medicine and to just take Tylenol to eliminate that nausea and vomiting. We also prescribe anti-nausea pills that are taken the day of the surgery to help with postoperative nausea and vomiting. Q: Why do I need to have a preop visit for my rhinoplasty surgery? A: All patients have a preop appointment with one of our nurses. For the out-of-town patients, this can be done over the phone. Pictures are taken, a thorough health history is reviewed, and all medications are recorded. It is at this time, within two to three weeks prior to the surgery that any needed laboratory or medical testing will be performed. Q: How many times does Dr. Portuese need to see me after my rhinoplasty surgery? A: Typically, Dr. Portuese will see patients approximately one week postoperative, one month, three months, six months and one year to check on the final healing phases of rhinoplasty surgery. Q: How much does a rhinoplasty cost? A: The costs for a rhinoplasty are dependent upon whether it is a primary or revision nasal surgery. Primary rhinoplasties usually cost approximately $5,200, which includes the operating room and the surgeon’s fee. There is an additional fee of $560 for the anesthesiologist. A complex revision rhinoplasty costs $6,200, which includes the operating room and the surgeon’s fee, and an additional $620 for anesthesia.